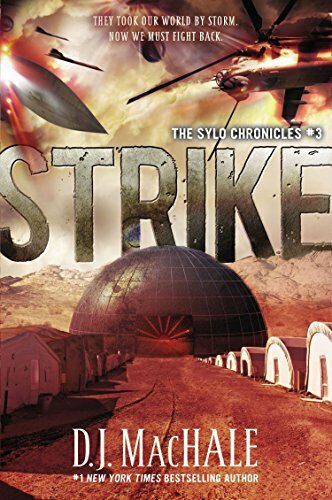 D. J. MacHale’s Storm: The Sylo Chronicles #2 picks up where Sylo left off. The books are best read in order. In Sylo, Tucker and his friends, Tori, Olivia and Kent, learned that Sylo is a branch of the U.S. Navy. As they fled the Sylo prison camp on Pemberwick Island where they’d been held captive and headed toward Portland, Maine, they witnessed an unbelievable battle at sea. Markings on the ships and mysterious singing black flyers indicated the combatants were the U.S. Navy and the U.S. Air Force. Is this the start of a new Civil War—one between branches of the military rather than the states? The teens hope to discover answers in Portland, but instead find it an empty wasteland. In some cases, blasted buildings mar the landscape. Shops and cars and houses are simply empty. All the people are gone. Are they dead? Have they been taken? The group finds a survivor who’d hidden in a hospital basement during the attack. Jon joins the teens and they set off for Boston where they hope to find more survivors and most importantly, some answers. But the highway to Boston is a nightmare. Boston itself is even worse. Planes fell out of the sky when everyone inside disappeared. Cars kept on moving when their drivers vanished, crashing into each other and careening over bridges. After the teens escape an Air Force battle fighter, Chris Campbell, the charismatic leader of an enclave of survivors takes them to Boston’s Faneuil Hall. Some 200 people live in relatively comfortable conditions with plenty of fresh food, water, battery-powered lights, and even gas cooking. For the first time in days, Tucker, Tori, Olivia, Kent, and Jon get rest, showers, and plenty of good food. Tucker gets restless early one morning when he can’t sleep and wanders around the survivors’ compound. He sees a dozen people—other survivors he knows—climbing into a bus. They’re strangely docile and don’t carry any of their belongings. They wear only the clothes on their backs. After watching the same thing happen for several days, Tucker convinces his friends to follow the bus to Fenway Park. The former survivors seem to be working as drugged slaves, building a monstrous structure for an unknown purpose. Just as Chris Campbell and his crew arrive and threaten to kill Tucker and his friends, Sylo planes attack Fenway Park and completely destroy it. Once more, the teens escape what appears to be certain death. In Portland they’d heard a repeating static-filled CB radio broadcast that gave coordinates for a location in the Nevada desert. The voice talked about a group of people who want to fight back, and asked for other survivors to join them. The teens decide to head there (via Fort Knox), but Tucker wonders if they will be betrayed again. It’s somehow appealing to see the teens stop at deserted stores to pick up food, clothing, and the other supplies they need. It’s interesting to watch them select the best cars for their journey from among the thousands left abandoned on the nation’s highways. After all, there’s nobody left to care. MacHale weaves an exciting, action-filled adventure filled with intriguing details. The story raises important issues. What do you do when the people you trust betray you? How do you keep on fighting when everything seems hopeless? While much of the story is compelling, several questions remain. Why is a 14 year old the leader of a group of older teens (and for a while, one adult)? And it strains credulity that the U.S. Air Force wiped out billions of people and all forms of life—except for the occasional bird. Are aliens involved, or do some really bad people control the Air Force? And is SYLO a savior or another enemy? After nearly 900 pages of reading, we know little more about what’s going on than we did when we started. One can only hope Book 3 of The SYLO Chronicles will reveal answers.